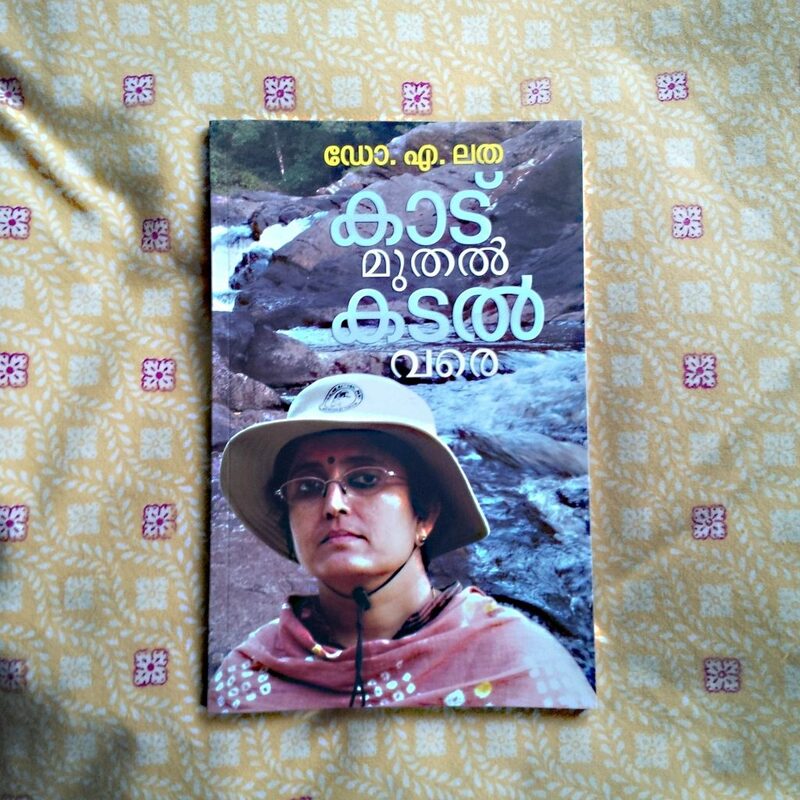 Noted river protection activist and ecologist, Dr.A.Latha who passed away in November 2017 left behind a special collection of essays and writings on a even more special subject related to the right of the river to flow and fulfill its ecological niche along with the rights of human communities with deep links to a life dependent on the flowing river and the biodiversity that is part of the riparian ecosystem. It is not by chance that the alternate media collective called Patabhedam chose Latha as one of the 25 change makers in Kerala as early as 2013. 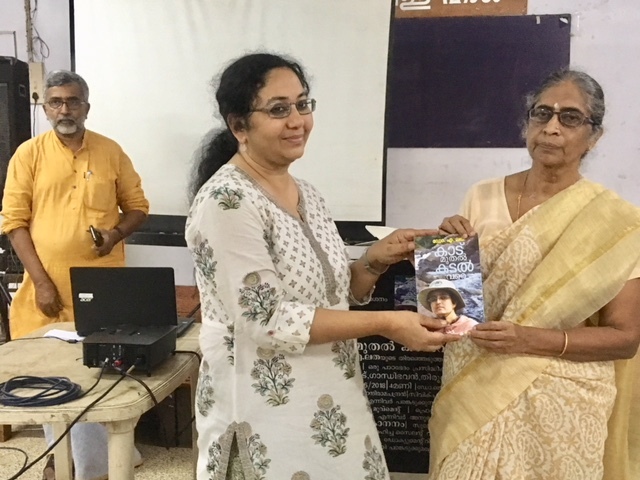 It is also not coincidence that Latha wrote in the magazine her thoughts on river protection and connected issues that has now been put together as a book by the same group called KAADU MUTHAL KADAL VARE (From the forests to the sea). This book collates 8 essays that Latha wrote in the past few years along with Manila C. Mohan’s special feature about Latha that appeared in Mathrubhumi weekly . The titles of her essays follow a pattern that reflects on the deep ecological thought that led Latha to become an activist who took up the cause of the Chalakudy river when the Government proposed the Athirapilly HEproject. Through the research projects and documentation that River Research Centre undertook under the able guidance of Latha, a whole body of material was produced to prove the fallacy of the Hydroelectric project, the inadequacy of river flow to produce the proposed electricity, the impact of the project on the forest dependant tribe Kadars living in the area, the rich biodiversity including the fauna in the river and also the downstream rights of the people in that area. All of these is woven in different and readable layers along the chapters in the book like a river flowing. The first essay “We need to revive the Water veins” portrays the plight of the rivers unable to reach its ultimate destiny –the sea along with the need for the river to flow to maintain its life giving features. These aspects are connected to the invasive activities like sand mining, dams, land-use pattern, pollution from industrial effluents, urban waste and pesticide runoff. The bottom line of all of Latha’s writings is the need to change our attitudes to a flowing river, to stop seeing it and all of Nature as a resource to be exploited . The most significant parts in this collection are her thoughts and relevant insightful inputs on how to revive the life of a dying river. The essay on the “Threats faced by Kerala’s Fresh water source” lists the 5 major threats in a lucid way ending with a simple but thought provoking note on how people, the decision makers, planners and the political powers should work in tandem to ensure the free and pure flow of fresh water in Kerala. The third essay full of hope and action oriented approaches portrays as the title says “Let us revive the Life giving water flow in Kerala”, 2 plans by which this can be done. The first one What can be done lists 7 simple but interconnected strategies and the second explains through 6 steps How this can be made practical. In the next essay with a title in Kadar language We do not need a Dam in this Universe ( Intha Adavil Dam venda), Latha reveals her deep commitment and bonds with the Kadars who are the actual human denizens of the forests along with a powerful statement on how their Forest Rights will be denied when development in the form of the dam comes up in the Chalakudy river. The most important part of the essay is the passage on the real value of the forests along with the fallacy of the KasturiRangan report along with the Impact Assessment Report’s inadequacies. The essay ends with a first person narrative by Geetha, the tribal chieftain in the Vazhachal hamlet titled Do not annihilate us. Latha moves on to more empirical and quantitative documentation in the next chapter called The Inevitable need for a Factual Assessment of the Impact of Large Dams. The chapter on how Kasturi Rangan Report will destroy Western Ghats is a fervent plea to Governments to shed the short term attitudes in development planning and adopt an ecosystem approach when planning. The comparison between Gadgil committee report and Kasturirangan report that figures in this chapter serves as a pointer on the real and sustainable way forward. The penultimate essay with a poignant title “ What the river has to say and what the Kasturirangan report has to say” is a bold statement about how short term, vested interests powered by political strategies can sabotage the real conservation of Nature that sustain human life and livelihood. The last but not the least chapter “How my river has changed” is the one in which the real personality of Latha as a sensitive, intelligent, deeply ecological and feminine person has emerged. This book can be seen as a beginning of a special kind of writing in Malayalam that combines deep, spiritual ecological thought with science quantification both of which need to blend together in the right proportion for Nature and Humans to co-exist further. Latha was able to touch upon this realization and give her name, her scientific temper and training, her creative, artistic mind and thought, her rational, intelligent brain along with her skill to communicate to the cause she took up- her life line became the flowing river for which she has now become a synonym. Anitha.S in communication with Dr.S.Santhi,Dr.J.Devika, O.V.Usha, Geetha Jayadas, Resalayan (Save Sahya Movement) Suchithra, Celin,K.V, S.Usha, Manju Vasudevan, Zabna,A.B, Jagadeeshan Kalathil, Civic Chandran,S.P.Ravi, Tomy Mathew, K.C.Santosh during the release of the book Kaadu Muthal Kadal Vare in Thiruvananthapuram on 17th June 2018. Details of book- Dr.A.Latha (April 2018) : KAADU MUTHAL KATAL VARE published by Patabedham and Folio Books. For details and copies contact 9388004100.